“There's a basket that's in between the two hulls that actually collects the debris from the water. The basket lowers, it skims the water, and any sort of floating debris that’s right in front of the basket, it collects it,” Levy says. In addition to pilot Cech, deckhand Sean Kingsley is aboard the Skim Pickens to get into the odd corners the boat can’t reach. And with all that tourism comes trash – a lot of it. Levy says his crews pull about 170 cubic yards of debris each year with their skimmer boats. 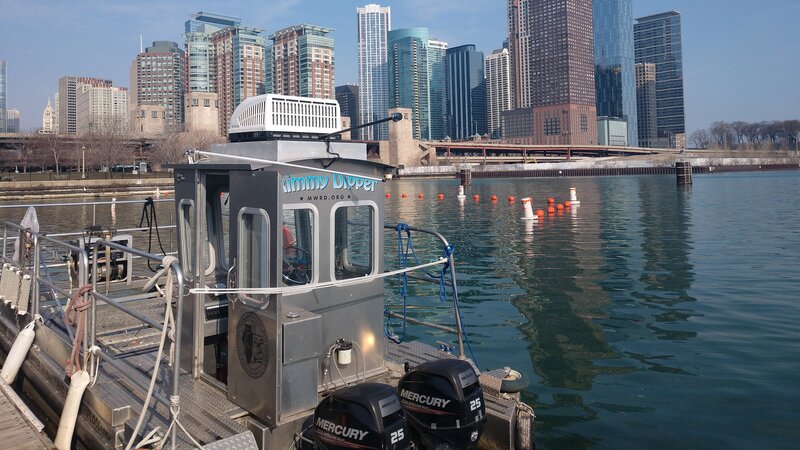 Once the basket is full, the skimmer travels to a site on the south branch, where a crane lifts the basket out of the boat and empties it into a massive container. But, Levy says, that kind of heroism is rarely needed. For the most part, the Skim Pickens and its crew are content to float under the radar, quietly doing the dirty – and wet – work that keeps our river sparkling.